We, the International League of Peoples’ Struggle, firmly and vigorously support the just struggle waged by the students and faculty members, spearheaded by the Ad Hoc Committee Against the Militarization of CUNY (constituted by Revolutionary Student Coordinating Committee, IGNITE, Internationalist Group, Sister Circle Collective, and others) against the hiring of the notorious war criminal General David Petraeus by the administration of the City University of New York (CUNY) as a professor of policy and on how best to wage war. We extend special support to the CUNY 6 (Augustin Castro, Jose Disla, Denise Ford, Luis Henriquez, Angelica Hernandez and Rafael Peña) who were brutally attacked and arrested by the police in the course of a peaceful demonstration in front of the CUNY Macaulay Honors College last September 17th. They were arraigned on the same day. They continue to be persecuted as US authorities refuse to drop the trumped up charges against them. They will be back in court on October 17th. The CUNY 6 were among the students and faculty members who exercised their right to assemble and speak. They chanted, “War Criminal Petraeus Out of CUNY Now!” They were against the teaching appointment of the former CIA chief and commanding general infamous for the brutal occupation of Iraq and Afghanistan, and for the malicious use of death squads and torture in both countries. They were also against the return of the Reserve Officers’ Training Corps (ROTC) to CUNY campuses after having been driven out in 1971 by student anti-war activists. We condemn the undeserved honors as adjunct professor being accorded by the CUNY administration to a stand-out war criminal. We repudiate the perverse reasoning of that administration that imposing such a brutal and callous character on the students of CUNY is an exercise of academic freedom and democracy. The CUNY administration is utterly condemnable for militarizing the campus, in providing stringent security measures for the benefit of Petraeus, in allowing police intrusions into the campus, and in promoting the return of the ROTC. We admire the progressive and militant students of CUNY for carrying forward the tradition of heroic struggles of CUNY students for democracy and peace against imperialism and war. We recall when CUNY students were moved by the spirit of internationalism and united with the communities of color and low income around their schools, in order to fight for and win open admissions and the creation of the Hostos Community College.The victory of the oppressed nationalities in winning democratic rights were bright examples of revolutionary struggle. In the spirit of anti-imperialist and democratic struggle, we praise highly the Ad Hoc Committee Against the Militarization of CUNY for uniting the students and faculty members to defend the university from militarization. It is correct for the Committee to intensify efforts to kick Petraeus out of CUNY, and conduct an informative and educational campaign concerning the brutal record of this criminal and the vile imperialist interests that he represents. 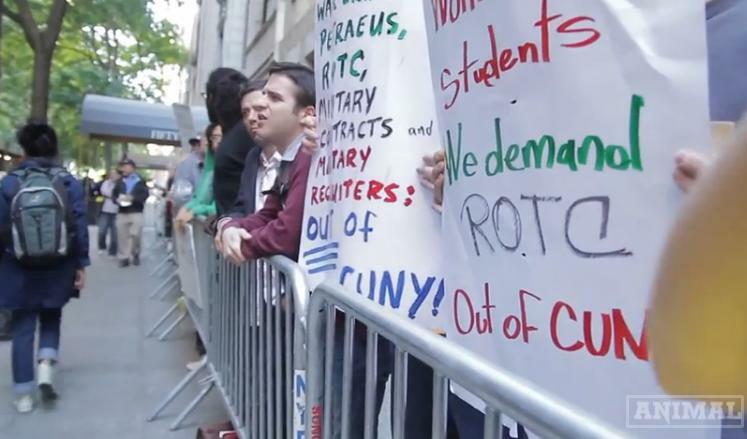 We encourage you to continue organizing and conducting protests against the return of the ROTC to CUNY. We appreciatethe Committee for being determined to expand to the campuses of all CUNY colleges and beyond, in order to generate a far larger anti-imperialist and democratic mass movement that will shake the oppressive structure of US monopoly capitalist society to its core, and help bring about the riseof the exploited and oppressed masses on the road of social revolution and freedom from the scourge of imperialism and reaction.